Season four is here! This show keeps getting better and better, which for me means it's a lot harder to find mistakes. 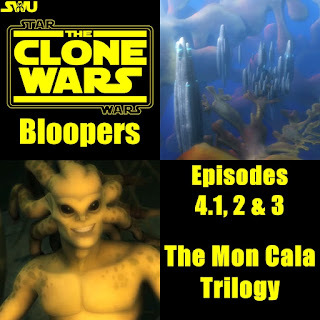 Due to a lack of time(and bloopers) I've combined episodes 1, 2 and 3 into one post. I do hope you enjoy this edition! ...but appears to have no wound. ...but doesn't get a scratch. This one showed up in a promo image about a week before the episode aired and started a minor controversy. 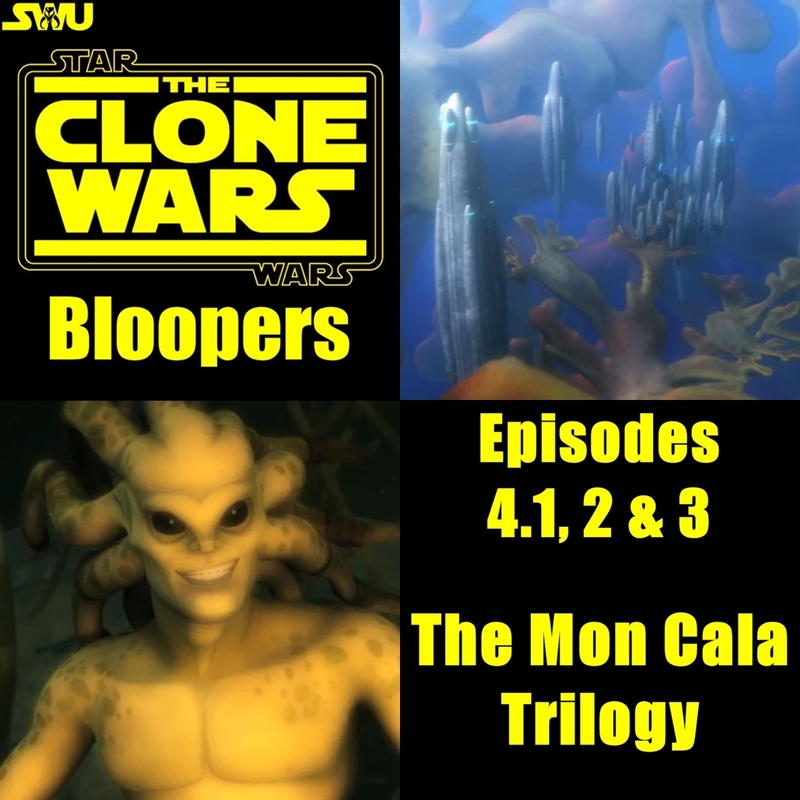 When the Republic and Mon Cala are retreating to the caves at the end of the episode, Anakin stops briefly to hold of off the one the Hydroid Medusa's tentacles. Just then you can clearly see his Lightsaber is on his belt... yet he's holding it, and it's ignited... Am I seeing double? ...and the second is just before she retrieves Anakin's helmet. I believe this is the first time I've seen TCW crew blatantly re-use a shot like this. he's looking towards Tamson and is not clutching his shoulder. ...but when they are escorted from the room they reappear on her belt. If I made some Faux pas of my own feel free to let me know in the comments below. Special thanks to my bud Ruari Williamson for pointing out many of the mistakes listed here! If you enjoyed this edtion of CWB please click the shares button below and tell your friends. These episodes definitely had the "WOW" factor. Back in the days of season one, few could have imagined what we're seeing now. The sheer scale of the battles would have been mind blowing above sea level much less below. Prince Lee-Char was an interesting character, in the first two episodes I really didn't care much for him but he had a lot of character growth in Prisoners that made him more likable. 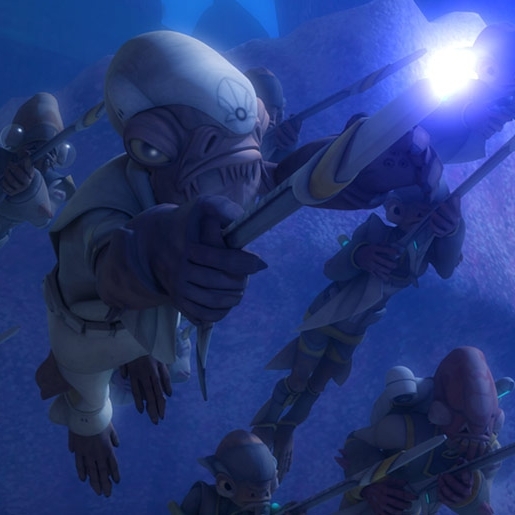 I would have loved to have seen more action but what we got was epic, especially the final battle with Quarren, Gungans & Mon Cala v.s Droids in Prisoners. Ackbar was spot on! 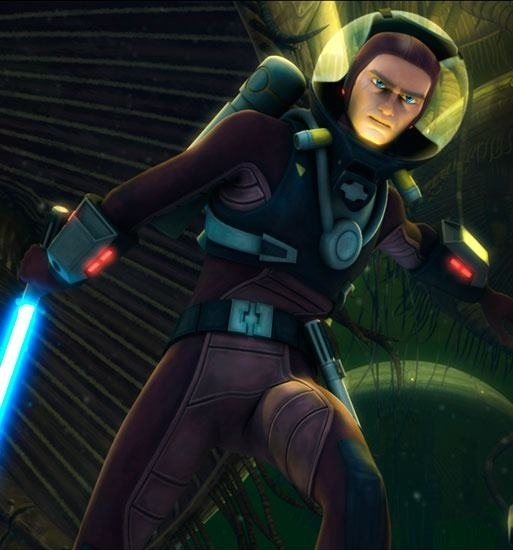 The actor who voiced him, Artt Butler, did a great job and the animation team made him very believable! Ahsoka has grown up a lot since the last time we saw her. Although some of her "Yoda-like" moments felt kinda out of character, I think it's just par for the course for her. She has steadily matured since the Clone Wars film and has definitely grown on me. All in all, despite it's minor faults which I pointed out above, these episodes were top notch and a continuation of the amazing storytelling that started last season. I give these episode an 8/10 rating.